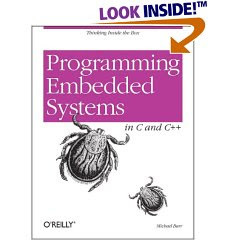 This book introduces embedded systems to C and C++ programmers. Topics include testing memory devices, writing and erasing Flash memory, verifying nonvolatile memory contents, controlling on-chip peripherals, device driver design and implementation, optimizing embedded code for size and speed, and making the most of C++ without a performance penalty. Embedded software is in almost every electronic device designed today. There is software hidden away inside our watches, microwaves, VCRs, cellular telephones, and pagers; the military uses embedded software to guide smart missiles and detect enemy aircraft; communications satellites, space probes, and modern medicine would be nearly impossible without it. Of course, someone has to write all that software, and there are thousands of computer scientists, electrical engineers, and other professionals who actually do. Each embedded system is unique and highly customized to the application at hand. As a result, embedded systems programming is a widely varying field that can take years to master. However, if you have some programming experience and are familiar with C or C++, you're ready to learn how to write embedded software. The hands-on, no-nonsense style of this book will help you get started by offering practical advice from someone who's been in your shoes and wants to help you learn quickly.